The Bad Boys are getting down to business. As the rest of Hollywood dressed up to the nines and celebrated 2018's brightest films and television series, the directors who created them, the talents who wrote them, and the actors who starred in them for the 2019 Golden Globe Awards on Sunday night, Will Smith had other plans. 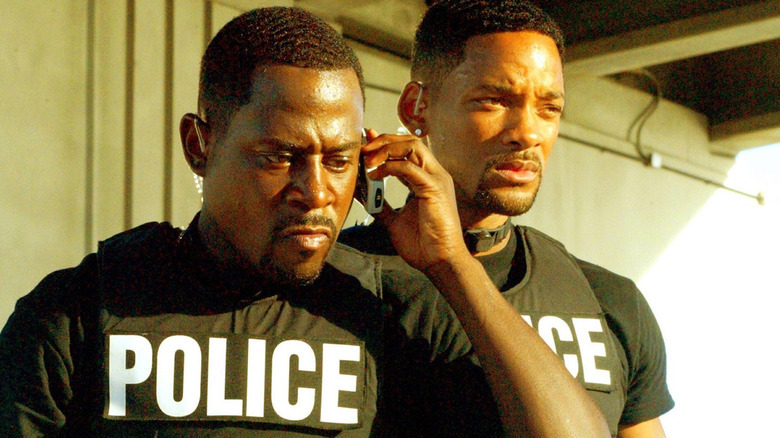 Set to reprise his Bad Boys role as Detective Sergeant Mike Lowrey in the franchise's upcoming three-quel, Smith took to Instagram on Sunday to tease the start of filming on Bad Boys 3. "Day 1. I'll keep y'all posted," Smith wrote in the caption of the photo, which depicts a stack of scripts for the film. Down the spine of each screenplay bundle reads the movie's official title, Bad Boys for Life — now stylized as Bad Boys for Lif3, because this is 2019 and simple formatting apparently means nothing anymore. The last we heard, studio Sony and directors Adil El Arbi and Bilall Fallah were planning to start principal photography in November 2018 and wrap in March 2019. Now getting off the ground two months later than reportedly anticipated, Bad Boys for Lif3 will probably conclude its first round of filming in May of this year, leaving plenty of time between then and the pic's January 2020 launch date to conduct reshoots if needed and complete post-production, which will, like all Bad Boys movies, likely necessitate a lot of CGI add-ins for all those wild action sequences. Obviously not in the business of spilling spoilers, Smith avoided dishing out any concrete information about Bad Boys for Lif3 in this reveal. This is because, well, he didn't have to. Before the actor even shared the snap to his 26 million-plus Instagram followers, Production Weekly came forward with new details on the film's story. According to the source, which has a strong track record of reliability, Bad Boys for Lif3 centers on "the Miami PD and its elite AMMO team's attempt to take down Armando Armas (Jacob Scipio), head of a drug cartel." The description continues, "Armando is a cold-blooded killer with a vicious, taunting nature. He is committed to the work of the cartel and is dispatched by his mother to kill Mike (Will Smith). Paola Nuñez will take on the role of Rite, the tough and funny criminal psychologist who is the newly appointed head of AMMO and Mike's former girlfriend — and the one who got away." Though unofficial, this plot summary aligns well with what's already been revealed about Bad Boys for Lif3. When the film cast Vanessa Hudgens, Alexander Ludwig, and Charles Melton as three officers in a "modern, highly specialized police unit," we discovered that the not-so-nice new kids on the block would "collide with the old school Bad Boys" as a "new threat emerges in Miami." At that time, Variety detailed that Sony hadn't yet selected an actor to play the film's main villain, suggesting that Hudgens, Ludwig, and Melton's characters might not necessarily be genuine threats to Smith's Mike and Martin Lawrence's Detective Sergeant Marcus Burnett. Sony has since tapped Guyanese-English actor Jacob Scipio, known for portraying Tomas in Lior Geller's We Die Young, to step into the central antagonist role. With both Smith and Lawrence bringing Mike and Marcus back to the big screen, a trio of newcomers emerging onto the scene (and potentially sparking an opportunity for a Bad Boys spin-off), a vicious villain ruining everyone's good time, and a woman from Mike's past making the already complicated situation even more difficult to navigate, Bad Boys for Lif3 has the makings of a fun, full-throttle action flick that should reinvigorate the franchise. After so much push-and-pull and uncertainty over whether the film would ever see the light of day, knowing that Bad Boys for Lif3 is finally, officially, for-real-this-time getting behind cameras has made the years-long wait worth it. Bad Boys for Lif3 is set to open in theaters on January 17, 2020.